What is the secret of Hamlet? While it may seem presumptuous to open with such a question, it is probably wise to start with one of the greatest literary works of all time, because all published works of the imagination have a lot of things in common, regardless of the skill of the individual writer. To put it another way: why does Hamlet continue to sell? We believe that there any number of reasons, but two or three are essential if we want to talk about publishing in the real world. For the writer of today, the marketplace is made up of airport outlets, high-street book­shops, and online booksellers, while feedback comes from blogs and news­paper reviews. Although things were clearly different in William Shakespeare’s day, Hamlet was a revenge tragedy, a popular potboiler, not a poetic work written in a moment of soul-searching by an author staring intensely at his navel, though it turned out to be both poetic and soul-searching (and intense navel-staring does have its attractions). The play was written for the public stage in the East End of early 17th-century London, and was seen by an audience which may, or may not, have been intellectually equipped to comprehend (a little, some, or all of ) it. Many people--the critics, let’s call them--would have thrown rotten eggs and been totally puzzled! At the same time, Shakespeare had hit on a story which was bound to fascinate a lot of people: Did my (beloved) mother and (cynical) uncle really dare to poison my (adored) father, the king, in oh-so-distant Denmark; and, if so, what should I (prince, and rightful heir) do about it? Very few people had ever been to Elsinore, so the “exotic” setting was perfect, and it was neutral--cold battlements frequented by ghosts, a graveyard in the night, people concealing themselves behind curtains, a play-within-the-play. And how many people in the audience had felt like stabbing a hated uncle, or punishing the mother who had made them? To the contemporary reader, Hamlet seems to anticipate the work of Sigmund Freud and dig deep into the complexity of human thoughts and motivations. This “modern” aspect of Hamlet is a blatant Leavisite fraud, however; women have always been amazingly complex--from Eve to Madonna--and blokes have never been slow to follow them down the dark and slippery slope, as Raymond Chandler, et al. have endlessly demonstrated in a million pulp novels. So, how does all of this act as an introduction to A Visible Darkness? Well, in the first instance, you have to remember that when Daniela and I began to write about Prussian magistrate Hanno Stiffeniis--it must be almost 10 years ago--we had no idea (but very high hopes) that we would be able to sell the first novel in what would, eventually, become a series. Books 2, 3, and 4 did not exist in any shape or form back then. Like William Shakespeare and everyone else, we were a one-book author when our revered agent, Leslie Gardner, sold Critique of Criminal Reason in the States to St. Martin’s Press, and the world rights in England to Faber and Faber. Suddenly we had a contract, and we were not slow to realize the implications: it was a contract for two books. At that point, and for the first time ever, we were faced with what can seem like a huge problem: where do we find another original story? Well, it’s worth remembering Shakespeare once more. When he needed an idea he turned to Plutarch, ancient Rome, the English chronicles, or any other source that happened to be available (and little known). Who knew or cared about Romeo and Juliet before the Bard put pen to paper? So, we sat down and began to concoct a new Hanno Stiffeniis investigation set in early 19th-century Prussia. To be honest, we went to the volcanic Mediterranean island of Ischia and lay beside a swimming pool for a week, extended to 10 days, while we tried to decide where Hanno Stiffeniis would go next, and what he would do when he got there. We had an “exotic” setting: Prussia. We had a little-known historical “context”: the Napoleonic invasion of Prussia in 1806. We had our “criminal investigator” (in the sense that Hanno Stiffeniis is not all sweetness and light, and that he has a guilty back story). So, what might happen when Emperor Napoleon attempts to impose French laws and French rationality on the hidebound Prussian homeland of the Brothers Grimm and Hanno Stiffeniis? The result of the blazing sun, blue sea, and good food in Ischia was Days of Atonement (2007), which is set in the coldest, darkest, poorest winter in living memory. Hanno begins to investigate a child massacre in his hometown, Lotingen, which takes him to the remote Prussian fortress of Kamenetz, and eventually to Bialystok in Poland, where he encounters the possible killer of the children in an asylum for the insane where Mesmeric medicine is used to cure all ills (obviously, this is the brief plot summary). Lotingen is an invention, of course, as is Kamenetz, and as for Bialystok, well! Mesmerism was a historical fact, and therefore it came in useful. We were on the road to telling lies professionally! Having done so twice with relative success, our publisher wanted more, and a contract for two more books came out of it. A Visible Darkness is the third in the series, and we are working on Book 4 (still untitled) at the moment. The fact is that telling the story does become easier, and for a number of reasons. By now, we know Hanno Stiffeniis quite well. We drew him first as a young, inexperienced magistrate, ex-student of the Prussian philosopher, Immanuel Kant, in the year 1804. He goes to Königsberg at the behest of Kant, solves a mystery, and watches Kant on his death bed. Many critics thought we had made a mistake by “killing off” our hero in Book 1, but the truth is that Immanuel Kant was never the hero. Hanno Stiffeniis is our protagonist, a man torn between Rational certainty and the gathering darkness of Romanticism. In the second novel, Days of Atonement, his philosophical mentor is no more than a distant memory, and Prussia has been crushed by Napoleon and the French invasion. Hanno is thrown into a state of intense conflict between his own desires for revenge on the foreign occupiers, and his duty as a Prussian magistrate who must work alongside the French invaders. For that second book, we created a brilliant French investigator, a flamboyant and creative “detective” who would taunt and challenge Hanno Stiffeniis. Serge Lavedrine was so successful--at least in the eyes of our editors, Walter Donohue at Faber, and Peter Joseph at St. Martin’s--that they both wanted him to appear again in our third novel, A Visible Darkness. But we had a different story to write this time, and Monsieur Lavedrine did not figure in it. We promised the editors, however, that we would bring him back in Book 4, and we are doing just that at the present time. So, what was/is the story contained in A Visible Darkness, the book we had to write? 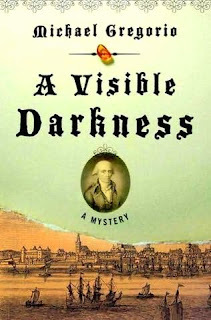 Well, the first thing to say is that--having denied our editors’ wishes regarding the second appearance of Lavedrine--we were very nervous about sending in the finished manuscript of A Visible Darkness. Would our editors, Donohue and Joseph, like it? Would they sit back patiently and wait for Book 4 before their hero finally reappeared? Donohue wrote back at once: “It’s the best thing you’ve ever done,” he said. Joseph sent a note which was just as enthusiastic. Indeed, he used the word “fantastic” six or seven times in as many lines! Had we written our own Hamlet? Well, of course, we hadn’t, but we had written our own Book 3, having learnt the lesson from Shakespeare, and just about everyone else. Book 1 takes place in Königsberg in February 1804; the story in Book 2 is set in remote East Prussia during the autumn of 1808; Book 3 takes place on the Baltic coast in summer, 1809; the action in Book 4 moves to the spring of 1810, and we will say no more for now! Circumstances throw Hanno Stiffeniis into the arena without a sword, and he finds himself up against insuperable opponents. Will he survive? Will he solve the crime and be able to go home to his wife and family in Lotingen? Now, may I share something in return?